What type of dietary approach do you use in the App? We use holistic nutrition principles based on scientific evidence to find and then address the cause of weight issues because we believe that successful weight loss happens by finding the root of the problem and implementing a diet and lifestyle that addresses it. We provide the best whole foods (plus meal plan based on them) that are proven to cut to root so weight loss is effective and sustainable. What is the Avoid tab for each category of foods? For each category of whole foods that naturally address the root of your weigh issues, you will see an Avoid tab at the top right. This is a list of the top foods to avoid (always along with the “why”) and simple, everyday Healthy Swaps that you can easily incorporate into your lifestyle and use instead. Do you endorse weight loss supplements in the App? We recommend vitamins, minerals and other nutrients available as supplements that are shown to be clinically effective for weight loss and weight management by being blood sugar-friendly, anti-inflammatory and metabolism-revving—to naturally address the three key issues underlying most people’s weight problems. What is your approach to exercise in the App? We believe that nutrition and exercise must go together for weight loss to occur, and for it to be long-term. We also know how difficult it can be to maintain a workout routine when life gets busy, so we provide exercise plans for home, gym and travel based on your current fitness level. So you can exercise no matter where you’re at! How do I know that the information in this App is coming from a credible source? The information in this App is provided and approved by our team of leading industry experts including registered nutritionists, dietitians, chefs, and personal trainers holding the highest levels of accreditation and experience in their fields. To learn more, check out Our Bios. There are very long scientific words throughout the App that I do not understand. How can I learn what these mean? Throughout the App we have provided linked definitions that will appear in a pop-up showbox within your screen. Simply tap on the grey underlined link to open and when you are done tap anywhere on your screen to close. Why do I see words in a green font throughout the App? All words in green are linked to the specific detailed food, supplement or lifestyle suggestion. This provides you with a convenient way to learn more about this individual diet, supplement or lifestyle recommendation and why we think it’s so special. Why are there shopping cart icons throughout the App? To make your everyday shopping easy and convenient, we have added a Shop feature for individual items that you may want to purchase. Simply tap on the Shopping Cart icon and a pop-up message will appear to indicate that the item has been added to your shopping list. Your personal shopping list is stored on your device under Shop for your reference, and you also have the option to email a printable document file (PDF) to yourself to view and print. How can I send myself my shopping list, meal plan and recipes, and exercise plans? Once you are ready to receive your shopping list, meal plan and recipes, and exercise plans simply touch the Email PDF box on the Plan and Shop pages. You will be asked to enter your email address and once you touch Send you will see a message indicating that your documents have been sent. You will then receive printable document files (PDFs) that you can print or view on your computer or handheld device. Is my email address saved when I enter an email address to sent the shopping list or plans? Do I have to register with WholeLife Holistic Nutrition? You are not required to register, and we have provided this optional feature for you to have the choice of receiving updated news and notifications when we launch new Apps. If you register directly on our site we will send you a FREE one day meal plan from Terry Walters, Best-Selling author of CLEAN FOOD and CLEAN START. What does SHARE the Weight Management App mean? When you touch the SHARE link on the Register screen, it will either ask you to login to your Facebook account or immediately open the “Post to Wall” window, this feature allows you to share the App information on your Facebook page with your family and friends. 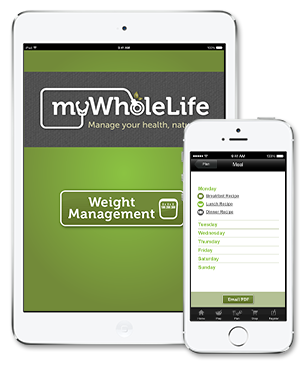 The Weight Management app was built to operate on iOS Version 5.0 and above for iPhone 3GS, 4, 4S, and 5, iPod touch (3rd & 4th generation), and iPad (1st, 2nd, and 4th generation) and iPad 2. Please ensure you are running the specified version or higher to ensure optimal performance. Where is the data stored? Does any data get stored on the my device? All information displayed under home, prep, and plan are stored remotely on our database and are accessed when you open the Weight Management app. The items you add to your shopping list will be stored on your mobile device. How can I learn more information about myWholeLife’s Services & Apps? To learn more you can link to the mywholelife.ca website from the app home screen or go directly to the website from your preferred web browser on your iPhone, iPad or computer.